From a new provost to NCAA tournament appearances by the men’s basketball and baseball teams to funding to expand undergrad research, 2018 was an eventful year at Wright State University. Here are some of the top stories we published in the Newsroom. 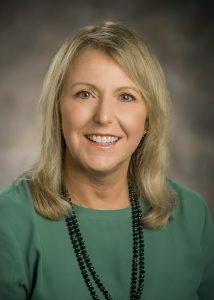 Susan Edwards joined Wright State as the university’s executive vice president for academic affairs and provost on July 30. “Dr. Edwards’ experience as a teacher, researcher and administrator; her leadership skills; and her personal commitment to student success make her the perfect leader to join our university at this time,” said President Cheryl B. Schrader. Edwards previously served as vice provost for faculty affairs and professor of biology at Appalachian State University in Boone, North Carolina. Expanding online courses, strengthening university-military partnerships and creating a health college are some of the projects prioritized in Wright State University’s proposed strategic plan. A total of 34 projects are included in the proposed plan. The focus of the plan, The Wright State Experience, emphasizes the university’s commitment to its students. The goal is to place students at the center of all aspects of the university’s mission and operations. Since the planning process began in December 2017, more than 1,300 community members have provided input into the plan. The process has also created an ongoing dialogue that encourages continuous reflection and revision of the community’s hopes and priorities. Over time, this process will help the Wright State community shape both its culture and future. 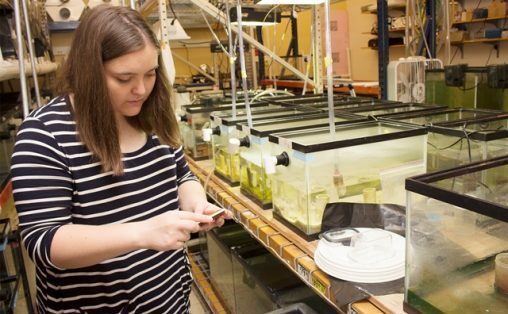 Ashlea Kennedy, an undergraduate Applying Scientific Knowledge research student at Wright State, works in the aquarium room. The National Science Foundation has issued a $1 million award to expand and further diversify undergraduate research in the College of Science and Mathematics. The five-year, $997,589 award will fund scholarships, programming and research activities for the Applying Scientific Knowledge (ASK) Program, which aims to increase retention, academic success and work and career advancement while providing students who have financial need with scholarships. The college will allot $630,000 of the award for scholarships for 42 students annually while providing five of the students a paid summer research experience. Nicole Scherzinger, who attended Wright State from 1996 to 1999, gave a talk to students in August. Grammy-nominated performer Nicole Scherzinger returned to the Festival Playhouse, where she performed as a student 20 years ago, to deliver an inspiring talk to current performing arts students. Scherzinger shared memories of performing in Wright State productions; talked about her highly successful career as a singer, actress and dancer; and gave sage advice to several hundred students during a special appearance at Wright State on Aug. 27. She also received the 2017 Alumna of the Year Award from the Wright State Alumni Association. A pilot project called Inclusive Courseware designed to dramatically reduce the cost of textbooks and online access content for students has saved them nearly double than what was originally estimated. In the nine courses, 24 sections and 1,029 students who participated in the project during the spring semester, students saved more than $102,400, for an average savings of 48 percent. This fall, the program continued expanded to include 40 courses impacting 120 sections and up to 6,105 students, with a savings estimate of $651,000. The men’s basketball team celebrate after winning the Horizon League tournament in March. For the third time in program history, the Wright State men’s basketball team played in the NCAA tournament after winning the Horizon League title. The Raiders’ season ended in the first round of the NCAA tournament with a 73–47 loss to Tennessee in Dallas. Wright State clinched a trip to the tournament with a 74–57 win over Cleveland State in the finals of the Little Caesars Horizon League Championship March 6 in Detroit. The Wright State baseball team earned its sixth trip to the NCAA baseball tournament in the last 12 years after winning the Horizon League tournament, with a 11–9 win over UIC on May 26 at Nischwitz Stadium. The Raiders earned the fourth seed in the NCAA tournament’s Stanford regional in California, losing to top seed Stanford 4–3 in a 13-inning game and Baylor 11–5. The Raiders ended the season with a 39–17 record. Wright State University adds $1.5 billion annually to the region’s economy and supports more than 20,000 jobs through its spending on operations and research and through spending by students, visitors and alumni, according to an economic impact study. The study concluded that Wright State benefits local businesses by increasing consumer spending in the region and supplying a steady flow of qualified, trained workers into the workforce. Wright State also generates more in tax revenue than it takes in, primarily from taxes that the state and local government collect from the added revenue created in the state. Emerging from years of overspending and budget deficits, Wright State posted a $7.2 million budget surplus this year and crafted a fiscal 2019 budget with a $3 million surplus that earmarks funds for strategic investments to bolster tuition revenue and build the university’s future. In fiscal year 2018, Wright State spent $50 million less than it did the previous year, exceeding the $30.7 million reduction called for in the original budget. Biologist Yvonne Vadeboncoeur received a Fulbright scholarship to conduct research on New Zealand rivers. Kno.e.sis Executive Director Amit Sheth was elected a Fellow of the American Association for the Advancement of Sciences and the American Association of Artificial Intelligence. Caroline Hillard, associate professor of art and art history, received a Fellowship from the Harvard University Center for Renaissance Studies to spend a year in Florence, Italy, researching the Etruscan influence on the Renaissance. Brian Rigling, interim dean of the College of Engineering and Computer Science, was named a Fellow from Institute of Electrical and Electronics Engineers for his contributions to synthetic aperture radar imaging. Madhavi Kadakia, chair of biochemistry and molecular biology, was named a Fellow in the 2018-2019 Class of the of the Hedwig van Ameringen Executive Leadership in Academic Medicine Program for Women. Caroline Cao, professor of biomedical, industrial and human factors engineering, graduated from the Executive Leadership for Academic Women in Technology and Engineering Program, where she worked on ways to build an ecosystem for entrepreneurship. She was also elected a Fellow of the Human Factors and Ergonomics Society and secretary-treasurer-elect of its executive council. The Wright State University Lake Campus opened its Agriculture and Water Quality Education Center in February. 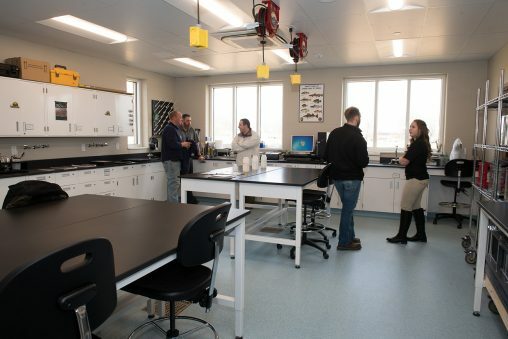 The building provides classroom space for the growing agriculture program; a hands-on research and laboratory area for applied learning and research on agricultural and water quality issues; an outreach facility for community meetings on agricultural production, water quality and other issues; and a focal point for partners to work proactively to support the regional agricultural industry as well as water quality efforts associated with nearby Grand Lake St. Marys and local watersheds.